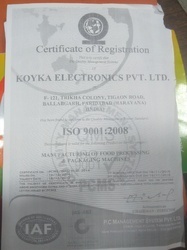 Established in the year 1997, we, “Koyka Electronics Pvt. Ltd.”, are one of the prominent Manufacturer, Importers, Exporter and Supplier of a various types of Sealing machines, Packaging machines, Filling Machines, Packing machines, Powder packing machine, Food processing machines, Snacks making machines and Multihead weigher machine etc. These machines are made in compliance with the international quality standards, using high quality raw material. Besides, we employ latest technology and advanced machinery for carrying out designing, manufacturing, packaging and other related processes. The entire range of products offered by us is widely appreciated in the market for its rugged construction, durable standards, easy installation & maintenance and efficient functioning. We can also customize these machines as per the exact details provided by the clients. We have a team of highly qualified & skilled professionals, which is the backbone of our organization. These professionals conduct stringent quality tests to make sure that our customers get a range of defect-free products from our end. Moreover, these professionals understand the industrial requirements and offer the products accordingly. Our state-of-the-art infrastructure also helps us in meeting the urgent & bulk requirements of the clients in an efficient manner. The advanced facilities available at our end enable us to produce a best-in-class range of products to our clients. These products are further tested on certain well-defined parameters to gauge their defect-free nature. Besides, we ensure to deliver the ordered products at the clients’ premises within the stipulated time frame. With the expert guidance of our mentor, Mr. Harsh Bhardwaj, our organization has been able to set a benchmark in this highly competitive market. Owing to the vast experience and excellent motivational skills, he has helped us to fetch recognition and garner a vast client base for our organization. Pouch packaging machines and automobile garage equipment. We aim at offering a quality-assured range of Pouch Packaging, Auger Filling, Sealing & Automatic Packaging Machines to the clients as per the market demand. Moreover, we provide these products in varied specifications to meet the market demand in the most efficient manner.